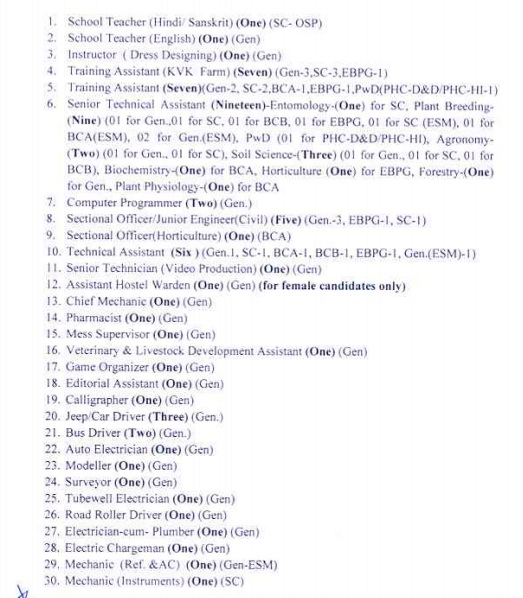 The Chaudhary Charan Singh Haryana Agricultural University invited application form for 273 Non-Teaching posts. Interested candidates may apply on or before 10.11.2015 up to 4.30 P.M.
For Educational Qualification and Age limit details, please click on the official advertisement- Notification for CCS HAU Jobs 2015. Application Fee- Candidates have to pay a non-refundable application fee in the shape of Demand Draft (DD). The DD must draw in the favour of “The Registrar, CCS HAU, Hisar”, payable at Hisar. Rs.250/- for SC/BCA/BCB/EBPGC candidates of Haryana State only. No fee for PWD/EXsm candidates. How to apply for CCS HAU Jobs 2015? Interested candidates may download the application form through www.hau.ernet.in. 1. last date for receipt of application form – 10.11.2015 up to 4.30 PM. 2. last date for receipt of application form for Candidates Residing Abroad- 26.11.2015 up to 4.30 PM. For more latest updates, stay connected with us.